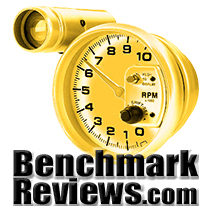 10/17/2012 – The agile Thecus® N5550 made its way into US media Benchmark Reviews for a serious test and review. Strict testing procedures were taken upon testing the NAS. In fact, three different benchmark systems were utilized, hence the media's name. The N5550 sports an Intel® Atom™ processor and 2GB of RAM, which comes standard to keep the system running strong. 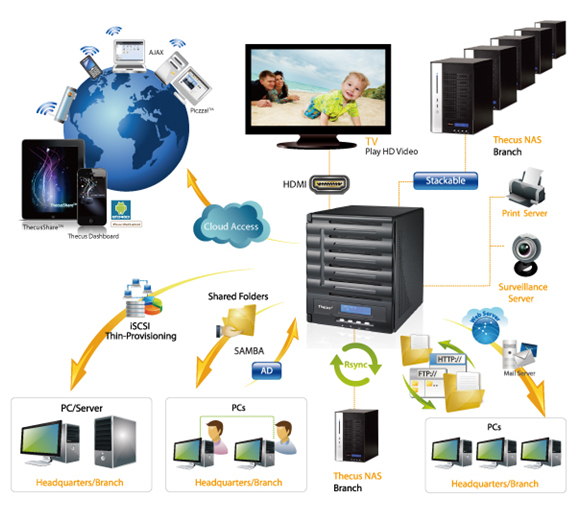 Advanced I/O such as HDMI output, eSATA and USB 3.0, makes managing your NAS a breeze. More importantly, a long list of available modules for the NAS is one of its key points. The most important digits to focus on are the benchmark results, the N5550 is no slouch. 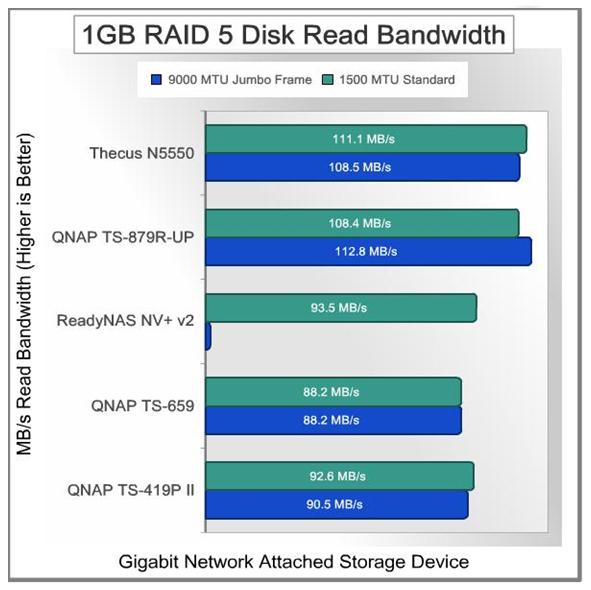 RAID 5 is the best setup to use when judging performance, due to its popularity when creating RAID. We found it odd that the N5550 was placed in a competition between higher performance base NAS; however the N5550 clearly shows its performance is neck-and-neck with storage devices which use Intel® Core™ i3 processors. The Thecus® N5550 is making a big hit in the entertainment realm, now-a-days more and more users are storing their multimedia files on their NAS. With local display and HDMI output, users can directly watch movies and enjoy music from their NAS. A centralized hub is a good way to see it. The function is simple, connect HDMI cable from NAS to TV, mouse/keyboard and start navigation through your media library. Have full confidence with the protection of McAfee Antivirus, the N5550 comes with the highly praised antivirus and better yet, software is included free of charge. Some key points include: daily update for virus pattern, 99% virus recognition, large scan capacity and reduced scan time. The N5550 is fully cloud compatible, whether you want to access via modules such as Amazon S3, Dropbox or Elephant drive, they all work seamlessly. If you are a kind of user that wants to bypass third party cloud suppliers, then utilizing ThecusShare™ and T-OnTheGo™ is a great way to manage data on your NAS or even stream multimedia direction over an IP.